Quantum's Carlo Fracassoli added World Champion to his resume again after winning the 2017 Melges 24 world title for the second time in August in Helsinki. Quantum’s Director of Offshore One Design Scott Nixon interviewed the Italian champion to learn about the event and his team's success. For the win - Team Maidollis celebrates their new world champion title. Photo by Pierrick Contin. 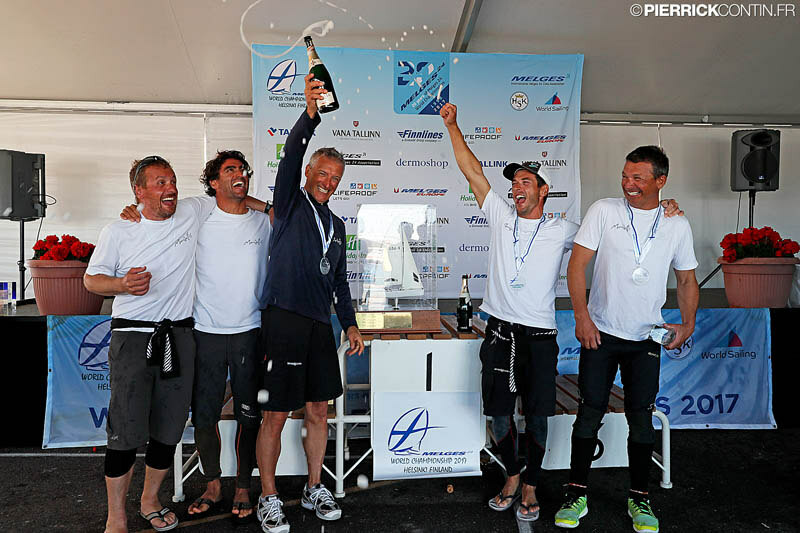 Scott Nixon: Congratulations on the huge win and your second Melges 24 World title. Tell us about your team members and your preparations for this year’s World title win. Carlo Fracassoli: Thanks, Scott. My team is composed of Chicco Fonda (tactical), Stefano Lagi (tailer), Gianluca Perego (owner and tree), Giovanni Ferrari (bow). To prepare for this year, we raced the Italian championship in Riva del Garda and the Swedish Championship in Marstrand before the Helsinki world championship. We knew the conditions in Finland were tricky and very different, so we prepared by spending six days before the championship in that sea. 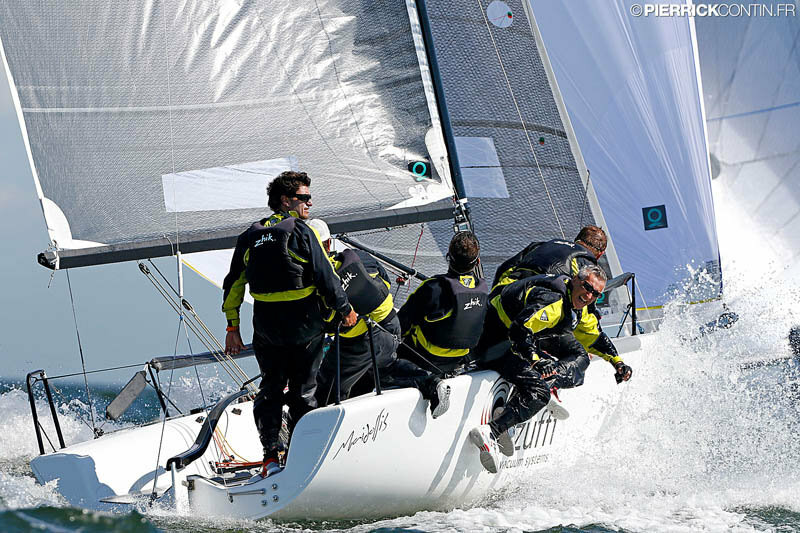 SN: How was this event similar and different from your 2012 Melges 24 world title? CF: In Torbole 2012, there were more boats and difficulties were greater, especially on the starting line. This was also our first race with Quantum sails. Every race we changed something to increase our speed. In Helsinki, we were confident of our speed in all conditions. We also had most of the same crew as in 2012. These things helped us a lot! SN: With your help, Quantum Sail won both the Open and Corinthian World Titles this year. Can you tell us about your involvement with Corinthian World Champions TAKI 4 that was also 5th in the open division? CF: Sharing the information about the tuning was important. Also the new jib I developed last year has been a nice speed update for TAKI 4. Chris Rast used it to win the European championship in Hyeres and take second with us at the Miami world championship. SN: What advice would you give to Melges 24 teams that are doing well in the class but still striving for that big class win? CF: First of all, work hard and believe in your team. Second, work hard on improving boat handling, speed, and maneuvers. Riding the waves - Maidollis flies downwind during the World Championship in Helsinki. Photo by Pierrick Contin. SN: What are the three keys to helming a Melges 24 fast in a big fleet? CF: Hiking hard, heel angle (always flat boat), and Quantum sails! SN: What are some of your tips on tuning the Melges 24 rig through a wide range of conditions? What are the key components for Melges 24 sailors to look for when setting up the rig? CF: The most important thing is to find the balance between mainsail and jib - that means easy sailing. The tuning guide is a good starting point, but it has to be adapted to the steering style of the helmsman. For example, I never use the vang in upwind. At the Helsinki world championship, we upgraded the boat’s upwind speed by moving the rake in very different wind conditions. SN: You have also had success with the Melges 32 class this season in Europe. Tell us about your program and current preparations for the Worlds later this month? CF: I’ve been sailing with the same team for three years. We have improved every race and this makes us very hopeful for the [Melges 32] World Championship in Porto Ercole. For preparing, here are definitely the most important things. We have worked hard on the rig tune and the shape of the sails and now we are very happy. We have a good feeling in light and strong wind. We still have to improve our speed a bit in 14 to 18 knot range. We will do four days of training before the World Championship to be ready. SN: What are your plans moving forward for the rest of the 2017 season and your goals for 2018? What classes are you targeting for these upcoming seasons in Europe? J70? CF: The next important event will be the Melges 24 world Championship in Italy at the end of August and then the J/70 World Championship in Porto Cervo. For 2018, I would like to continue our reign at the Melges 24 European Championship and work with sponsors to defend the world title in Canada. For sure, the J/70 class will be a main focus, both because of the number of boats and the quality of the crews! SN: Will you come to Victoria, B.C., in Canada to defend your title in 2018? You can view the full results of the 2017 Melges 24 World Championship and read more about the event here.